The above rock was collected on our Sedimentology & Stratigraphy class field trip last month. It is an average piece of weathered Brassfield Formation (Early Silurian, Llandovery) from Oakes Quarry Park near Fairborn, Ohio (N 39.81472°, W 83.99471°). It is made almost entirely of crinoid fragments, and has a pleasant pinkish hue, most of which comes from the crinoid bits themselves. If you look closely you can see crinoid thecal plate fragments as well columnals and pluricolumnals. 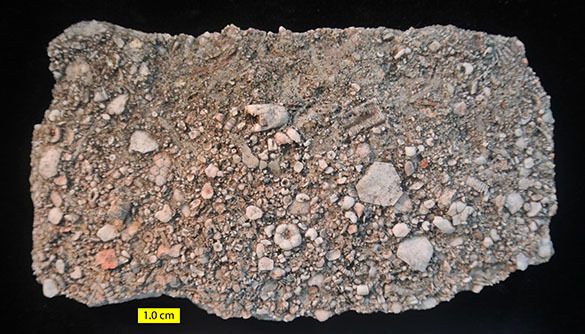 This kind of limestone in which echinoderm ossicles make up the bulk of the grains is known as an encrinite. I first learned about encrinites from my colleague Bill Ausich of The Ohio State University, who has written the best assessments of encrinites on a regional scale. Encrinites are well-washed biosparite grainstones typically deposited between fair weather and storm wave bases on shallow shelves in low latitudes. They are surprisingly common from the Ordovician into the Jurassic, but then the disappear from the rock record as crinoids declined in abundance in shallow environments. We’ve seen encrinites before in this blog from the Silurian of Estonia, the Triassic of Poland, and the Jurassic of Utah. Ausich, W.I. 1986. Early Silurian inadunate crinoids (Brassfield Formation, Ohio). Journal of Paleontology 60: 719-735. Ausich, W.I. 1997. Regional encrinites: a vanished lithofacies. In: Paleontological events: stratigraphic, ecologic and evolutionary implications, p. 509-519. Columbia University Press, New York. Ausich, W.I. and Deline, B. 2012. Macroevolutionary transition in crinoids following the Late Ordovician extinction event (Ordovician to Early Silurian). Palaeogeography, Palaeoclimatology, Palaeoecology 361: 38-48. Hunter, A.W. and Zonneveld, J.P. 2008. Palaeoecology of Jurassic encrinites: reconstructing crinoid communities from the Western Interior Seaway of North America. Palaeogeography, Palaeoclimatology, Palaeoecology 263: 58-70.